Located in Sassuolo Italy, Panariagroup's R&D lab is in the world center for ceramic tile innovation. As Milan is to clothes, Sassuolo is to tile. Scores of artists and computer experts work around the clock to perfect the look of our new lines, both at Panariagroup and at nearby graphics companies. “Styled in Italy” has heavy emphasis on the ‘style’. Italian technicians and their American counterparts develop new product lines on state of the art machinery. New production lines in Lawrenceburg have the most up to date decorating equipment available. Compared to ceramic, porcelain clays are cleaner, whiter, and more expensive. One reason porcelain is more expensive, higher quality raw materials and less impurities. The clay must be cleaner, the feldspar must be finer, and there can be no contamination. A typical porcelain body is composed of clay, silica, sand, and feldspar. Glazes contain feldspar, clay, frit, and color. The color is the expensive part, it contains precious metals. Florida Tile uses premium ingredients to make a superior product used both residentially and commercially. The raw materials and 30% water are mixed in a ball mill and turned into a homogenous slip. The slip is dried into prills in a spray drier. The prills are spheres of body and ~6% moisture. Florida Tile has invested heavily in the best, most innovative equipment available to make the best possible product. This ball mill (above) is an exclusive Panariagroup innovation that allows for extra control of the body. This one in Lawrenceburg is only the 2nd of its kind in the world. The prills are conveyed to presses and fill the die cavities. Up to ten 12”x12” tiles are pressed at a time, other sizes require different dies, up to 24”x48”. Not all available tile sizes are pressed on all sides. Please note some sizes are pressed, finished and professionally cut. Inquire at the time of ordering to learn more about production methods of certain sized tiles. 7,000 lbs per square inch are required to press porcelain. These are among the largest presses in the world. They have to be big to press porcelain hard enough. The more compact the body, the lower the water absorption. Florida Tile uses state of the art presses to make the size and warpage of our tile as consistent as possible. This gives you a superior product. Inquire at the time of ordering to learn more about production methods of certain sized tiles (including professional cutting). Molds (or matrixes) are silicone overlays that form the contours of the surface of the tile. The more molds a product has, the more variation you will see from piece to piece. Typically, the more molds involved, the more expensive the tile because each mold costs money to design, purchase, and replace when worn. Florida Tile’s products emulate those found in nature with rich coloring and unique variations from piece to piece. Our glaze lines are longer than a football field to fit state of the art equipment. The Lawrenceburg glaze lines are the longest of any Panariagroup plant allowing for the most decorating equipment possible and future expansion. 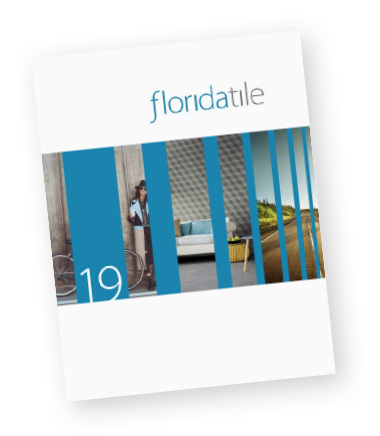 Florida Tile strives to manufacture more sophisticated products by using more sophisticated techniques. The pressed and decorated tiles are dried to 4% moisture. The normal thickness tiles spend 45 minutes in the kiln before being cooled and stacked for storage. Thicker tiles require more time. The product is pressed as a 13”x13” and through extreme heat will become extremely hard as a 12”x12” product. Our average breaking strength exceeds ANSI® requirements. It may cost a little more, but the benefits of porcelain require this extra heat and duration to do right! State of the art lasers measure the size of each tile and assign calibers. Lab personnel assign shades based on targets. Highly trained sorters inspect each tile for visual defects. Automatic packaging machines do the rest of the work. Florida Tile is one of the few manufacturers that laser and inspect each piece before boxing. Our quality controls are the most exacting and assure excellent technical specifications. Automated functions help to make our tile affordable. Small batch, irregular or custom sized tiles may be cut from larger tiles.